Reading and share top 6 famous quotes and sayings about Which Road To Take by famous authors and people. Browse top 6 famous quotes and sayings about Which Road To Take by most favorite authors. 1. 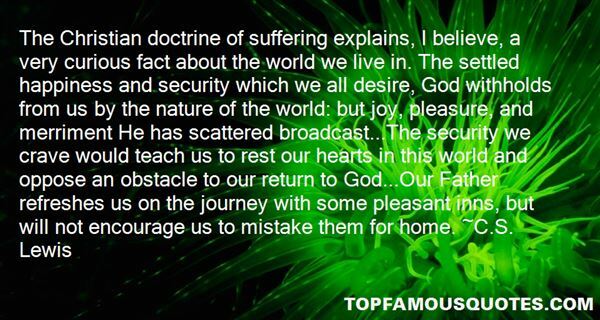 "The Christian doctrine of suffering explains, I believe, a very curious fact about the world we live in. The settled happiness and security which we all desire, God withholds from us by the nature of the world: but joy, pleasure, and merriment He has scattered broadcast...The security we crave would teach us to rest our hearts in this world and oppose an obstacle to our return to God...Our Father refreshes us on the journey with some pleasant inns, but will not encourage us to mistake them for home." 2. "We stand on a mountain pass in the midst of whirling snow and blinding mist, through which we get glimpses now and then of paths which may be deceptive. 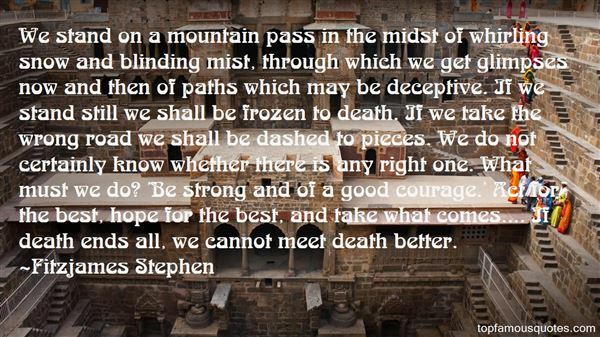 If we stand still we shall be frozen to death. If we take the wrong road we shall be dashed to pieces. We do not certainly know whether there is any right one. What must we do? 'Be strong and of a good courage.' Act for the best, hope for the best, and take what comes.... If death ends all, we cannot meet death better." 3. "A subject to which few intellectuals ever give a thought is the right to be a vagrant, the freedom to wander. Yet vagrancy is a deliverance, and life on the open road is the essence of freedom. To have the courage to smash the chains with which modern life has weighted us (under the pretext that it was offering us more liberty), then to take up the symbolic stick and bundle and get out." 4. "One of the powerful functions of a library — any library — lies in its ability to take us away from worlds that are familiar and comfortable and into ones which we can neither predict nor control, to lead us down new roads whose contours and vistas provide us with new perspectives. Sometimes, if we are fortunate, those other worlds turn out to have more points of familiarity with our own than we had thought. Sometimes we make connections back to familiar territory and when we have returned, we do so supplied with new perspectives, which enrich our lives as scholars and enhance our role as teachers. Sometimes the experience takes us beyond our immediate lives as scholars and teachers, and the library produces this result particularly when it functions as the storehouse of memory, a treasury whose texts connect us through time to all humanity. "[Browsing in the Western Stacks, Harvard Library Bulletin NS 6(3): 27-33, 1995]"
5. "No matter which road you decide to take on your life's journey, just make sure God is an intimate part of it." 6. 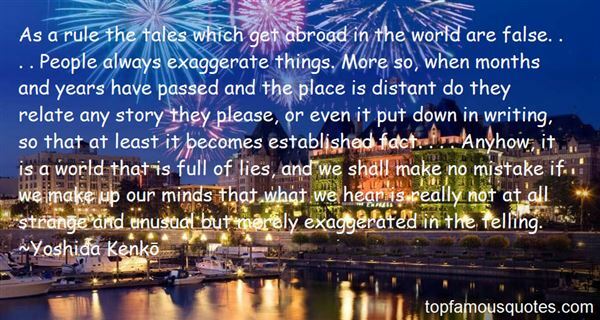 "As a rule the tales which get abroad in the world are false. . . . People always exaggerate things. More so, when months and years have passed and the place is distant do they relate any story they please, or even it put down in writing, so that at least it becomes established fact. . . . Anyhow, it is a world that is full of lies, and we shall make no mistake if we make up our minds that what we hear is really not at all strange and unusual but merely exaggerated in the telling." Busy days galore...thoughts in a kaleidoscope of dervish dances."